Having candy at your child’s birthday party is a must. However there are tons of new candy toys out there to have as a perfect complement! These are perfect to use as table decorations, to spruce up a candy buffet, or to add to goodie bags. We have tons of candy toys online, but these are some new items we’ve added that we think are neat. If video games are the theme, then you definitely should add these Pac Man mints. These Pac Man shaped candy mints are packed up in a retro looking arcade game. Or, be sure to add these Super Mario Surprize Cubes for candy and stickers or these Mario Sour Candy tins to keep up with the themes. My Little Pony is another popular party theme for children, so be sure to get plenty of sparkly, fun candies that match the decor! These My Little Pony candy tins have one of the characters on the front with yummy candy inside. Plus, these tins are reusable and perfect for other trinkets your child collects. Any kid would love to get a Bubble Blaster Squirt Toy! This squirt gun has a ton of miniature, colorful gumballs for them to enjoy after they’re done with their pool and backyard activities. 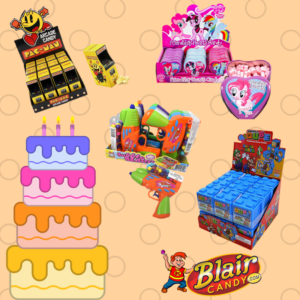 There are tons of other novelty candy toys and party candy online at BlairCandy.com! You’ll find everything you need for a sweet party that your child and their friends won’t forget. Happy National Milk Chocolate Day! 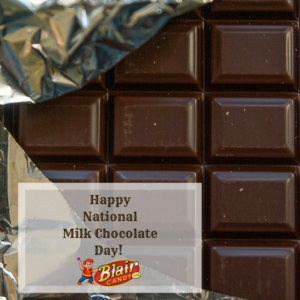 Milk chocolate is in a lot of our favorite candies and there are so many candies we can celebrate with today. Of course you should grab your favorite, but we recommend this pairing. If you want to celebrate with a nostalgic candy, definitely try this Rocky Road candy bar. This bar contains fluffy marshmallows and cashews and topped with a layer of milk chocolate. Snickers bars are one of America’s favorite candy bars. Nougat, peanuts, caramel, and of course a layer of milk chocolate. We highly recommend celebrating National Milk Chocolate Day with a box of Snickers in bulk. Can’t choose between Milk Chocolate and another kind of chocolate? Hershey’s Pot of Gold is the answer! Not only will you get tons of milk chocolate with caramel and nuts, but also other chocolate types to eat or share with someone. You definitely should have a classic Hershey’s Milk Chocolate bar on National Milk Chocolate Day. But, we recommend that you splurge for the 5lb Hershey’s bar. Share it with family and friends or eat it all yourself. We won’t judge! 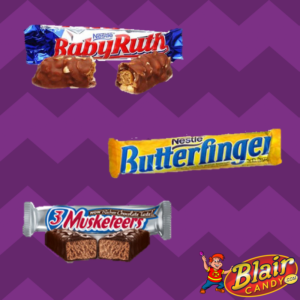 Celebrate National Milk Chocolate Day with these and plenty of other milk chocolate treats at Blair Candy! Find all of your favorites and a few new ones by browsing online today. Gummy Sharks: If you love gummy candies, then you definitely should get a bag of these. Choose from either blue gummy sharks or colorful gummy sharks for a delicious gummy treat! Shark Bite Lollipops: Play with this fun shark toy while watching the commercials and enjoy the lollipop inside them during the program! They come in a couple styles and flavors so everyone finds one they like. Sea Critter Gummies: There are other sea creatures seen during Shark Week too! This box of gummies has sea turtles, seahorses, crabs, and octopi to snack on while you’re watching. They’re also individually wrapped so you can enjoy them after the festivities too. See these and other novelty candy treats today so you can celebrate Shark Week anytime! 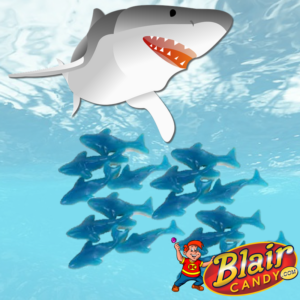 Shop now at BlairCandy.com and be sure to tag us on social media if you make anything cool with your shark candy. Ah salt water taffy. 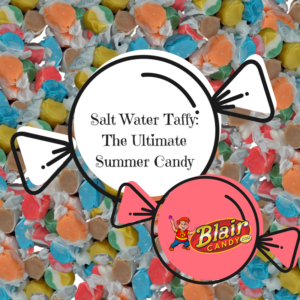 From our grandparent’s candy dish to gift baskets here and there, salt water taffy is a summer candy staple. But do you know about its accidental start? According to many historians, salt water taffy was an accidental creation in candy store owner David Bradley’s shop in 1883. His Atlantic City, New Jersey shop had been flooded during a major storm and water had completely soaked his stock of taffy. Later, a young girl came into the shop and asked if any taffy was for sale. He jokingly offered her the “salt water taffy” and the rest was history. After that, it became a main summer candy on the east coast boardwalks. It was so lucrative, that there was actually a Supreme Court decision in 1921 over a dispute on improvements to taffy pulling machines. Until then, candy shops could only make about 300lbs a day by hand. With a machine, they could make roughly 10,000lbs. Now, candy shops roughly make five times that amount, annually. Salt Water Taffy has been a summer treat mainly because it didn’t melt, making it a perfect candy among the summer resorts. Some of these “antique” candy stores are still in business selling the same taffy creations from the past. We bet you’re craving a piece of taffy now! To learn more about the history of salt water taffy, visit the Smithsonian and Mental Floss for more. Visit BlairCandy.com for an assortment of salt water taffy in bulk and other sizes. Just be sure you have enough to last you all summer! Celebrate Lollipop Day with these Lollipops In Bulk! Staple Lollipops: Tootsie Pops, Charms Lollipops, Chupa Chupa, and Blow Pops are the classics. Celebrate with their original flavors or try some of their limited time flavors for a twist on favorite. Novelty Pops: These lollipops are just plain cool. Choose from your favorite characters, interesting shapes, new flavors, and even some that are made into toys! Classic Lollipops: What do you normally think about when you think of a lollipop? You’re probably thinking of these. The oversized rainbow swirl pop or the single color swirl that comes in every color imaginable. There’s also crunchy rock candy that fits into this category too. 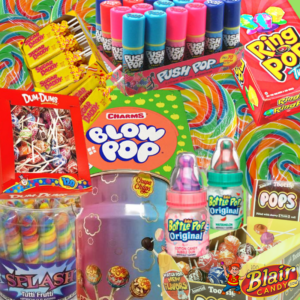 No matter which type you’re looking for, classic, novelty, or a staple lollipop, BlairCandy.com has them all. Grab a bag or get lollipops in bulk to celebrate all year! First, you should definitely take advantage of the fun gummy candy that is out this time of year. Sharks, fish, turtles, octopi, even frogs are ready to go on display and be enjoyed by kids (and adults) of all ages. Ditch the gummy peach rings and make your gummy candy really nautical. Second, stay away from some chocolates during the warm summer months. No one wants melted chocolate unless it’s on a sundae. To add some kind of chocolate element, consider chocolates with a candy shell on the outside, like Sixlets or M&M’s. Finally, consider some candy toys or novelty treats to add. Not only do you have another candy option on the table, but they also double as decoration. Also, you can really tailor this to the theme of your party. 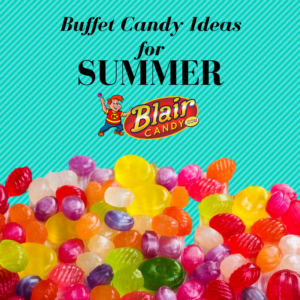 The buffet candy options are endless at BlairCandy.com! Find classic staples in summery colors or go crazy with something unique. Whatever you choose, you’re sure to have the most talked about party on the block! It’s Almost National Gummy Worm Day! July 15th is National Gummy Work Day! Gummy worms are a candy that everyone loves, either in regular or sour forms. Eat individually, add to Jell-O, or to a famous dirt pudding and they’re irresistible. So what’s the history behind this well-loved gummy candy? While the rest is history, both Trolli and Haribo have their own versions of this creepy crawly gummy candy. Many worms are the combinations of flavors, making them striped. The most common combos are red/orange, red/white, and green/yellow. There are also the original gummy and sour sugar flavors that are both pretty popular. Do you like gummy worms? Have a preference for sour vs. sweet? You can read more about your favorite treat here on the Huffington Post. 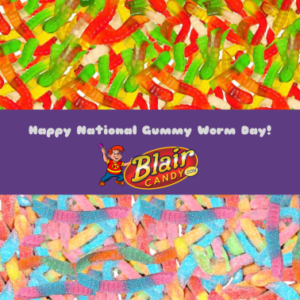 Whichever you choose, we hope you have a Happy National Gummy Worm Day! Shop all of your favorites at BlairCandy.com and celebrate every day! New Candy You Have to Try! This nostalgic candy is making a comeback! Fortune Bubble Gum is a delicious stick of bubble gum with a fortune inside. These are fun as a party favor or just for a fun family night in. These hard candies are a timeless classic. These sanded lemon drops will make everyone who has them pucker up. Also, these candies will taste super fresh because they are naturally flavored with California Lemons! Smarties + lollipops + tropical flavors = delicious summer treat! Smarties Tropical Lollipops have multiple flavors per bucket of lollipops and with 60 in each bucket, the combinations are endless. You’ll want to watch a movie with this movie theater box of Lifesaver Gummies. With the original flavors plus a new orange flavor, you’ll find yourself wanting more of these delightful gummies. Have a favorite flavor of Sour Punch Straw? Get a box of your favorite flavor or go for the rainbow straws which have combinations of the flavors! What’s great, is each package has smaller, pre-portioned packages inside for easy, on the go snacking. 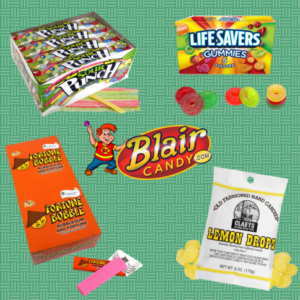 There are so many other new candy treats at BlairCandy.com! Be sure to stop by soon to see what new candy in bulk is here to spice up your snack time. Sugar Free Candy that Tastes Like the Real Thing! Life Savers candies are such a staple, aren’t they? Fill your candy dish with this fruity hard candy without feeling any guilt. You can also take them on the go because of their convenient individual wrappings. All of your favorite flavors are in this bag, so you won’t miss out. Chocolate makes everything better, so Hershey’s made a sugar free version of their delicious chocolates to make sure everyone has a great day. Enjoy sugar free milk chocolates or dark chocolate in these delicious bite sized pieces. Jelly Belly has so many delicious flavors don’t they? Enjoy flavors like buttered popcorn, cinnamon, tangerine, green apple, pear, licorice, cherry, lemon, pineapple, and strawberry that are all sweetened with Splenda. You’ll enjoy all these delicious flavors without the sugar! There are plenty of sugar free candies that taste like their original counterparts at BlairCandy.com. 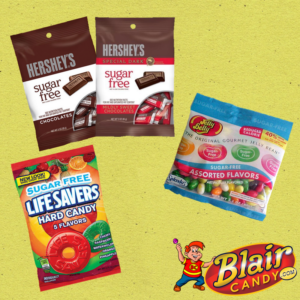 Shop these and other sugar free candy today for the ultimate taste test!